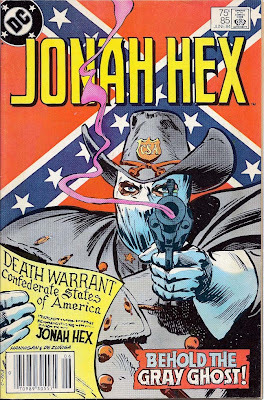 Matching Dragoons: Jonah Hex #85 "Behold the Gray Ghost"
Jonah Hex #85 "Behold the Gray Ghost"
Well, this story has no exclamation point in the title, so you know something is wrong! What's wrong is that Jonah Hex has gone bi-monthly with this issue and it is also the 100th Jonah Hex story penned by Michael Fleisher. So what happens in this bitter-sweet issue? For starters a bunch of guys in Confederate outfits are burning Jonah Hex in effigy, shouting death to the traitor, Jonah Hex. But then they come to their senses & realize that they'll probably never have revenge on Hex. Just then Quentin Turnbull emerges from the shadows, chastising them for being so spineless. He has actually done something about Hex. Turnbull has hired the Gray Ghost!!!! Several days later we get our first glimpse of the Ghost as we are witness to a wedding that is rudely interrupted by a hooded Confederate officer. The Ghost claims that the groom betrayed Confederate troop movements and that the Ghost will carry out the death sentence. 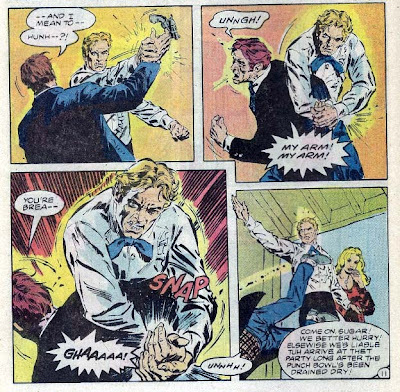 The Ghost draws his pistol and shoots the groom right in the middle of the service. The Ghost backs out of the doors and hightails it but the men inside are unable to give chase because the doors were blocked. When they finally bust out of the church they spy an older gentleman and ask if he saw the Ghost ride off. The old man points them out of town and the posse mounts up and heads out as the old gentleman gets on his horse and rides the opposite direction literally whistling Dixie. Needless to say, the posse doesn't find the Ghost (because he was the old gentleman) and the posse start asking the sheriff if he knows who the Gray Ghost is. The sheriff replies that all he knows is that Ghost was a Confederate officer whose family was butchered during Sherman's March to the Sea (late 1864). When Gen. Lee surrendered, the Ghost didn't, he continued slaughtering Union soldiers and kill former Confederates on a list that he made of traitors to the South. 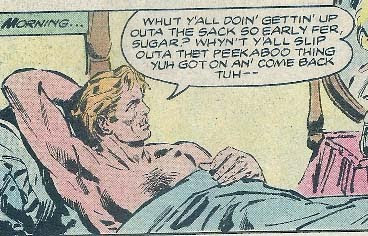 A week later, on the outskirts of New Orleans, Adrian and Jonah Hex are getting ready for a dinner party. Jonah is looking pretty dapper in formal dinner attire, but he ain't none too happy about it. It's only been two weeks since he met Adrian and they have been living in her Grandma's former house. Adrian puts a liplock on Jonah and as they get ready to leave they encounter Clifford, Adrian's former fiance. Clifford, berated throughout all of New Orleans, is there to win his honor back and he pulls a pistol on Jonah. In one swift move, Jonah disarms Clifford, breaks his arm and then throws him out the door like last weeks trash. Elsewhere, Brett and his two female cohorts have decided to let Emmy Lou out of the closet where they have imprisoned her. She can stay out on one condition, she help rob their next bank. She refuses but quickly changes her tune when they start to shove her back into the closet. Several hours later, Jonah Hex and Adrian are returning home from the dinner party, via a fancy buggy. They happen upon an old gentleman carrying a small bag & a saddle. The man explains that his horse stumbled and broke a leg and he asks for a ride. Jonah & Adrian oblige. During the ride, Adrian learns that the man's name is Gray but suddenly a shot rings out and a bullet grazes Gray's scalp, knocking him unconscious. There are three men on a hilltop taking potshots at the buggy. Jonah hands the reins to Adrian, grabs his rifle and quickly sends one of the men to his final reward. Jonah manages to wing another in the leg before they hightail it off into the darkness. Adrian checks on Mr. Gray and finds that he is alive and offers to take Gray to her house to help him recover from his wound. Back at the house, Adrian does a fine job of doctoring Gray and she tells him to spend the night in an upstairs bedroom. Back in town, Clifford is disgusted to learn that the three men he hired to kill Jonah Hex not only failed, but killed an innocent man in the bargain (Mr. Gray). The two thugs tell Clifford to shut up and get ready with the ten thousand dollars they were promised because they are going to finish the job tonight. The next morning at Adrian's house, Jonah is in bed and Adrian is already up when she decides to check in on Mr. Gray to see if he needs anything. What she doesn't know is that Mr. Gray has donned the garb of the Gray Ghost and is getting ready to carry out Turnbull's orders to kill Jonah Hex. Adrian walks into Gray's room and sees the Gray Ghost. He tells her to be quiet because he has never harmed an innocent but she scream out for Jonah. 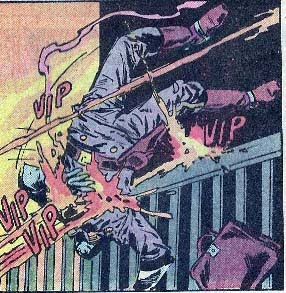 Jonah hears the gunshot and leaps out of bed and heads for the stairs. The Ghost is standing over the body of Adrian and vows to make Jonah Hex pay for Adrian's life (he has some serious issues with responsibility!). Jonah shouts from the bottom of the stairs that he has found the death warrant that the Ghost had for Jonah and Jonah & the Ghost end up in a Mexican standoff at the top and bottom of the stairs. The Ghost realizes that he can't kill Jonah, at least not tonight, and decides to cut and run by bailing out a second story window. Just as he is getting ready to vault off the balcony, who should show up but Clifford's goons. They spot a Confederate figure on the balcony and open fire, knocking the Ghost to his death. Jonah heads up the stairs and finds that Adrian is only wounded. The next day, the local doctor tends to Adrian's wounds and states that in a month or two she will be fine. When Jonah questions the doc about the Ghost, the doc stammers that the Ghost died while the doc was attempting to dig out the bullets. As the doc heads away from the mansion, he is stopped on the road by the Gray Ghost. The Ghost thanks the doc for patching him up and telling Hex that he is dead, then hands over a fat wad of bills. The Ghost and the doc go their separate ways. Timeline - This one must start right after last issue. It takes 'several days' from the start of the story before we are introduced to the Gray Ghost and then it is the 'following week' that Clifford gets his arm broken. I will place this finishing up around the middle to end of June, 1878. Adrian is one heck of a woman. Last issue she kills a guy, this issue she smirks as her former fiance gets his arm broken, she takes a bullet and is still going. She's fairly bossy, dragging Jonah all around New Orleans; fairly spoiled, partying non-stop; and completely into the scar-faced bounty hunter. I laughed at the start when the Fort Charlotte brigade realized they are a bunch of losers! The ending seems fairly rushed with Jonah finding the death warrant that the Ghost dropped and Adrian surviving her gunshot wound. But we now have another lunatic hunting down Jonah Hex. And I'm sure that we'll be seeing more of him. One last thing, do you like Jonah Hex all fancied up? Next Issue: Emmy Lou in a bank robbery gone bad, the Gray Ghost returns, and Jonah Hex visits a pastry bar!!! Didn't the "Gray Ghost" also show up in an old Batman story? Or am I thinking of something else ...? You're thinking of the character created for Batman: The Animated Series. That "Gray Ghost" was a fictional TV hero idolized by a very young Bruce Wayne, thus becoming a partial inspiration in Bruce's later adoption of the Batman persona. Fittingly, the Gray Ghost of B:TAS was voiced by Adam West. And I think Jonah looks good all dolled up. Not so much naked in bed, though.